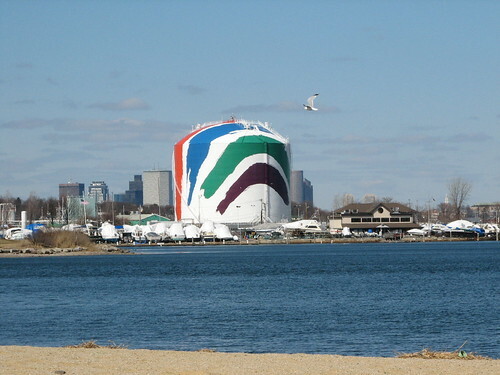 Multi-coloured brush strokes on a 43 metres (140-foot) high LNG storage tank in Dorchester, Boston, USA is the largest copyrighted work of art in the world. 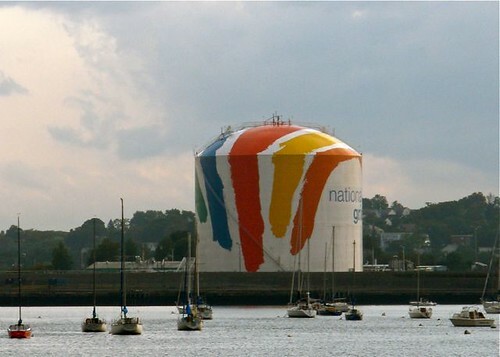 Known as 'Rainbow Swash' it was created by by Corita Kent in 1971, when Boston Gas, the erstwhile owner of the LNG complex in the area, commissioned her to paint one of the two gas tanks so as to make it more presentable to the motorists driving on the nearby Southeast Expressway. The multi-coloured brush strokes became an instant hit but also attracted criticism from many who saw a profile of Vietnamese leader Ho Chi Minh's face in its blue stripe. The artist was a peace activist and some believed that she purposely camouflaged a face of Ho Chi Minh in the painting. This was however denied by the artist. The real truth will never be known as the Corita Kent died of cancer in 1986. The controversial painting is also gone but its replica can till be seen today. 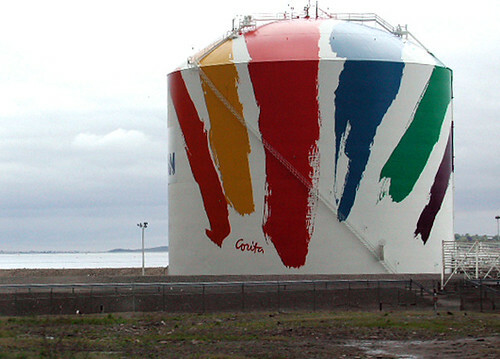 The original tank was demolished in 1992 and the 'Rainbow Swash' was recreated on the adjacent second tank with less pronounced blue stripe so as to hide the illusory face. Boston Gas was acquired by Keyspan and later Keyspan was acquired and merged into National Grid plc whose logo was therefore placed over the original logo in September 2007. Very nice summary, and thanks for choosing my photo to go with your post! i drive by this tank almost everyday and although i tried, i could never notice the famous side profile(maybe because i needed to keep my eyes on the road! )until this picture.... But the depth of this theory is worth investigating further into to see if in fact Corita Kent meant to paint his profile. That would be a pretty neat art work there!! You are the Man-on-the-spot and most suitable person to cross check the theory about the face in the blue stripe. Perhaps you can find some free time and delve into past history to find the truth. If you ever find it please do let me know and I will gladly include it here with due credit to you.